Now, I realize you can’t always control your emotions. There will be times you won’t feel happy, regardless of what you do — I’ve definitely been there. 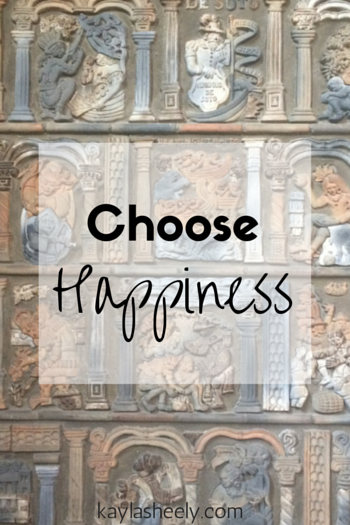 But I also think we have more power to choose happiness than we give ourselves credit for at times. There have been things in my life recently that I could easily let rob me of my happiness. But by making the conscious choice to not focus on the actions of others, I’m learning to not let others steal my joy. There will be sadness, pain, discomfort, awkwardness, and negativity. But you have the power to choose how you will react. You choose what you allow to influence your mind, thoughts, actions, and heart. Even when it seems like you can’t escape the drama — choose to smile. Choose to laugh. Other’s actions only affect you as much as you let them. Previous Post Yoga Selfies in D.C.